Amongst other stars and star clusters can be seen Matariki and Puanga (Rigel in Orion). 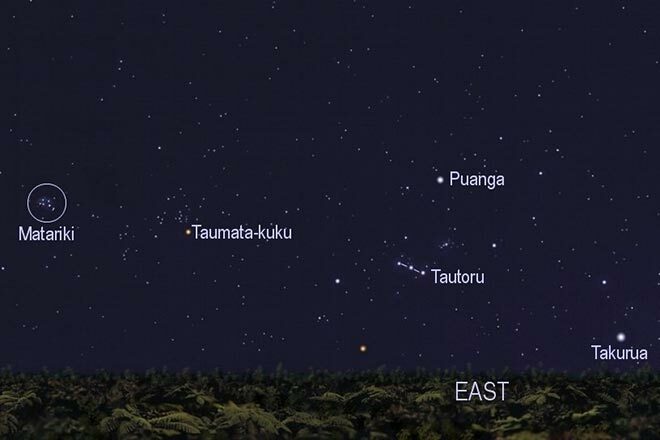 For some Māori tribes, it was the rising of Puanga that signalled the new year rather than Matariki. Whichever the sign, for all Māori it was a time to celebrate seasonal fertility and remember those who had passed. Permission of AstronomyNZ must be obtained before any re-use of this image. why is it that maori groups all over NZ post upside down pictures of matariki? Can't you guys do some outreach? Its embarrassing to see northern hemisphere photos of the pleiades plastered over newspapers from Aotearoa. Kia ora Just a little confused in regards to puanga, can someone please enlighten me as to why puanga is noted on top of tautoru but according to creek mythology (Rigel in Orion) is documented as the left foot. Would really appreciate some help.